Artocos are folded shell structures that capture and combine solar energy and wind to generate power, create space to inhabit and contemplate the surrounding ecosystem, and make visible and audible environmental processes that shape our lives. Each piece is composed of a double layer wall oriented to the path of the sun. Internal walls are clad with dark-colored thin film photovoltaic modules. Air enters through grated air intake vents facing the predominant wind direction. Sunlight heats the air in the chamber between the walls generating a convection air current while activating the photovoltaic cells. 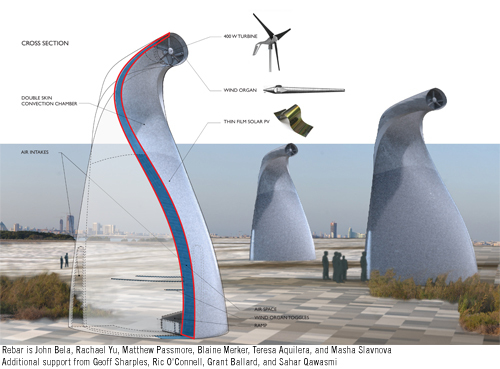 The double-layer wall curves and folds to enclose a wind turbine and three flue organ pipes. Air moving through the double wall rises and accelerates to power the wind turbine and activate flue organ pipes that generate musical tones. Artocos is inspired by and derived from one of the lesser-known inhabitants of the Ras Al Khor wetland adjacent to the site. 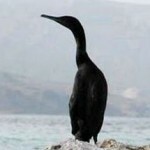 The Socotra Cormorant, Phalacrocorax nigrogularis, is a cormorant that is endemic to the Persian Gulf and the south-east coast of the Arabian Peninsula. Its color is almost entirely black. In breeding condition, its forecrown has a purplish gloss and its upperparts have a slaty-green tinge, there are a few white plumes around the eye and neck and a few white streaks at the rump. The birds are highly gregarious, with roosting flocks of 250,000 having been reported, and flocks of up to 25,000 at sea. Since 2000, this species has been listed as Vulnerable on the IUCN Red List, on the grounds of its small range. Its number are suspected to be undergoing a continuous and rapid decline because of human development near its nesting colonies; a recent estimate of the world population put it at about half a million. The form and orientation of the piece is generated by a direct response to the site environmental conditions. Site One features excellent solar access and substantial wind from the northeast. Facing south, the thin film solar module clad double wall is oriented to maximize exposure to the suns rays. The body cavity and air intake valves are oriented to the northeast, facing the predominant wind movement. Artocos feature a double-layer wall that capture and combine solar energy and wind to generate power. Air enters via the grated intake valves and passes into the chamber between the double wall. The interior skin is clad with ~ 65 square meters of thin film solar modules that absorb heat while generating electricity. ~65 square meters of thin film solar modules produce a steady 3 kW for 7 to 8 hours in the summer and an average of 1.5 kW for 4 to 5 hours in the winter. Air in the chamber heats and rises through the walls and is directed to an enclosed wind turbine. The turbine is based on the Airbreeze model by Southwest Windpower, Inc. Operating at 20% efficiency, the 400 Watt, 46” diameter Airbreeze generates 700kWh per year. Air exiting the chamber turns the turbine and passes through the flue organ pipes, generating power and music. 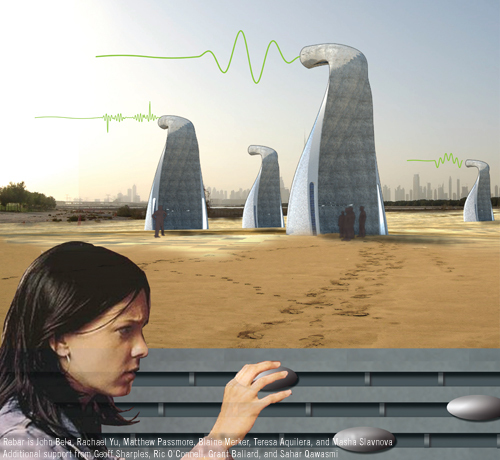 Site One, located between the Ras Al Khor wildlife sanctuary and the proposed Lagoons development, is an opportune setting for a project that introduces a new aesthetic of ecological function combined with energy generation, engages current and future urban residents in the complex dynamics of urban ecosystems, and explores the critical role of decentralized power production through the medium of public art. To the west of the site, the Ras Al Khor Wildlife Sanctuary represents an enclave of relative wilderness amidst swirling traffic and sprawling urban infrastructure. Located just as the name in Arabic suggests – at the Cape of the Creek, it is among the few urban protected areas of the world. The mangroves, mudflats, lagoons, sabkhas, reedbeds and shrubs form a wonderful wetland coastscape that supports both nature and local people. Recognition of its global importance has promoted its ecological, educational, cultural and aesthetic values. Formerly a wide, muddy intertidal area, dredging operations in the ‘70s and ’80s changed habitat. Large areas of mudflats associated with the tidal inlet, were reclaimed with dredge spoil. Only pockets of natural habitat survived and these were protected. Large scale mangrove plantations in the conservation area followed. According to data from numerous sources, water quality at the site is a serious challenge. With the proposed major development around the site, it is anticipated the volume of treated sewage water entering the wetland will soon increased considerably. To the east of the site is the proposed Lagoons development. If constructed, the Lagoons development will cover an area of 70 million square feet (6.5 million square meters). Seven artificial islands will be linked to each other, consisting of residential apartments, shopping malls, office buildings, five-star hotels, resorts, a museum, marinas, and Dubai’s first opera house. At present the project is suspended; however, a leading regional property developer has announced that the Dubai Lagoon substation has been completed and is ready to be commissioned. Built to ensure uninterrupted electricity supply for the massive community project, the substation is part of the developer’s effort to complete the site infrastructure. It is in this context that we propose our art piece and intervention to demonstrate the elegance and beauty of renewable power production integrated in a dense urban and ecologically rich setting.